Peaches are reminiscent of summer no matter what time of the year you enjoy them. Their unique, fuzzy skin and soft, sweet flesh distinguishes them from their cousin, the nectarine. Peaches are often seen in crisps, cobblers and pies, but remember that peaches are delicious in more than just dessert recipes. Try tossing them in a salad for a lovely addition of colour, taste and texture. You can also enjoy them lightly grilled or blended into your favourite barbecue sauce. There are two main types of peaches available today: Semi-freestone and Freestone. 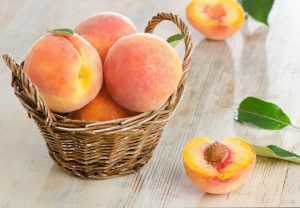 Freestone peaches will have a stone or pit that will easily fall from the fruit, and are usually the ones you’ll find at your grocery store or farmer’s market. They are available from Ontario from mid-August to the end of September. These are a great choice for eating out of hand and for preserving. Semi-freestone peaches have flesh that partially clings to the pit. These peaches are excellent for eating out-of-hand. They are available from Ontario from mid-July to mid-August. You may also spot donut peaches. This heirloom variety is short, flat and white-fleshed with a lower acidity level than traditional peaches. Clingstone peaches, as their name indicates, have pits that cling to the fruit. These are not usually available at retail and are more often used for commercial purposes such as canned peaches and jams. Peaches range in colour and can be anywhere from light pink and cream to a reddish-yellow. The blush or colour of a peach does not indicate ripeness, but is a way of identifying the variety. Be sure to avoid those that have any green colouring or soft spots. 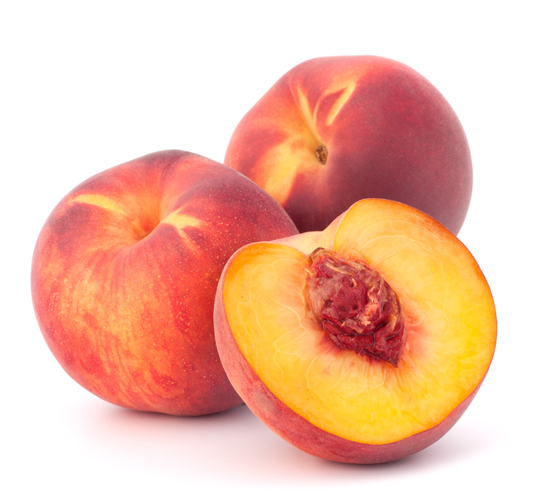 When selecting peaches, look for fruit that feels heavy for their size, and that have a creamy or yellow background. Don’t be afraid to buy peaches that are firm. To ripen peaches, place them in loosely closed paper bag. Leave them on your kitchen counter (at room temperature and out of direct sunlight) for a few days. If you really want to speed up the process, add an apple to the bag. Don’t use a plastic bag as this will trap moisture and can cause premature decay. When your peaches are ripe, store them in a plastic bag in the refrigerator, or in their original plastic clamshell packaging, and they will last for up to five to seven days. Peaches are ripe when give slightly to pressure and have a sweet aroma. If you buy a container full of peaches, we recommend opening it when you get home to sort according to ripeness. Enjoy those that are already ripe, first! To Freeze Peaches, peel and pit them, then cut into slices or cubes. Make a simple sugar syrup and submerge them in a plastic container. Alternatively, add some orange juice to keep them from drying out. Pack tightly into plastic containers, leaving 1-inch (2.5-cm) air space at top. Top with a crumpled sheet of wax paper and seal tightly. Frozen peaches can be stored for one year. 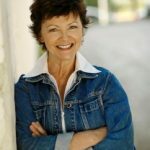 Watch this fun segment featuring Mairlyn Smith. 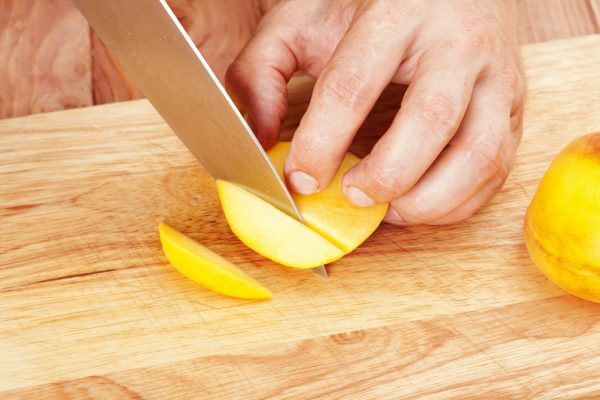 To prevent browning, simply coat sliced peaches with lemon juice immediately after slicing. Another solution is to dip the slices into water that has a squeeze of lemon. Wash peaches just before you are ready to use them. Washing them in advance will only make them spoil faster. To remove the pit, cut your peach lengthwise around the stone (follow the natural indent on the peach) and gently twist both halves in opposite directions to separate them. If the peach is of the freestone variety, the stone will pop out easily. Peeling stone fruits is a breeze. With a small knife, score an “x” on the bottom of the peach, then place in boiling water for 30 seconds and transfer them to an ice bath (to stop the cooking process). Their skins should slip off easily. After peeling, immediately return them to the ice bath to prevent discolouration. Top Tip! For the most flavour, peaches are best enjoyed ripe, at room temperature. 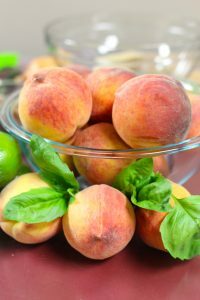 Peaches will discolour quickly after being cut, so if you aren’t combining them with something acidic, such as lemon juice or salad dressing, quickly dip the fruit in water with a squeeze of lemon and drain well. Sniff a peach for ripeness. If they are ripe, they’ll smell sweet. Grill peaches to caramelize the natural sugars in the fruit. Cut a ripe peach in half and remove the pit. Grill over medium heat for about 2-3 minutes per side to emphasize the flavour. 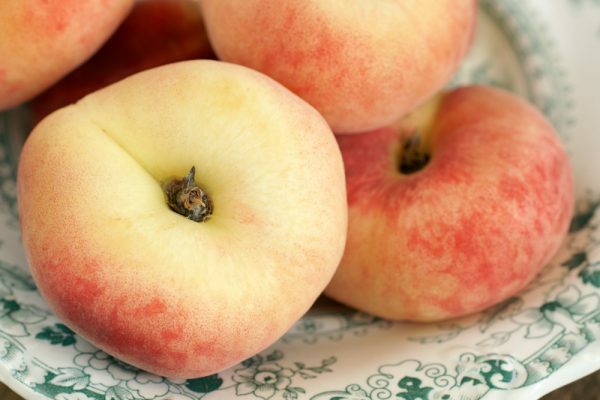 Peaches add great natural sweetness to smoothies, oatmeal, etc. 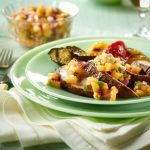 There’s nothing like eating a fresh juicy peach out of hand, but there are so many other ways to enjoy peaches, too! Bake them with some cinnamon and sugar in a peach pie, peach cobbler, or crisp. 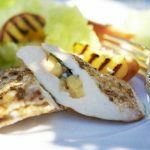 You can also grill or roast them to be served in a salad, or with a big scoop of vanilla ice cream or mascarpone cheese. To enjoy the fresh taste of ripe peaches in the winter months, preserve them in a jam, or sliced in a mason jar with syrup. Substitute the apricots for peaches in this easy no-cook jam recipe! Try using peaches to create an irresistible sauce for chicken wings. Or turn it into a salsa to top tacos or pork tenderloin. 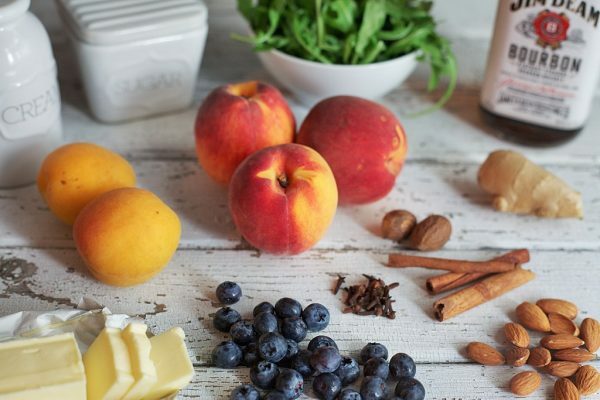 For an elegant sweet dessert, try making peach crème brûlée or Ontario Peaches Foster. 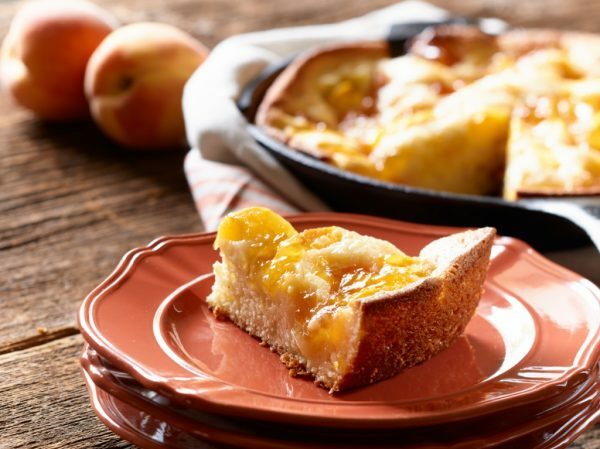 Make breakfast extra special by serving these buttered crepes with caramel Ontario peaches or our baked Strata recipe. 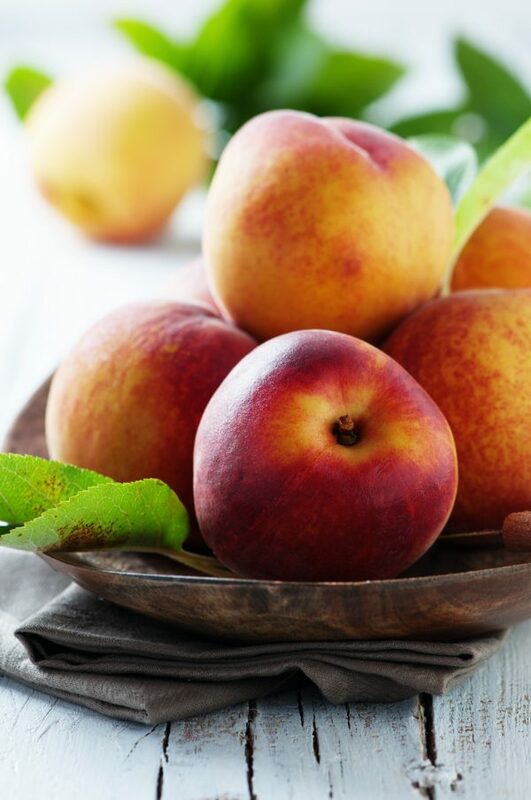 According to the Canadian Nutrient File, 1 medium peach (98 g) contain a great number of your daily-recommended intake of nutrients: 11% of Vitamin C, 4% of fibre (1.9 g), 5% of potassium, 4% of Vitamin A, and 3% of copper. Ontario Peaches with Mairlyn Smith!